The word "gospel" means simply "good news." God is a fair judge and must punish us for whatever we do wrong. 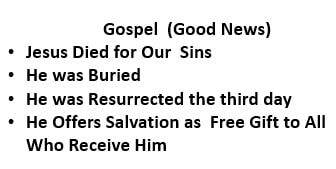 The gospel is the good news that God loves us so much that He came in human form (Jesus) and paid the penalty for our sins! ...He is also a loving father who provides a way for us to obtain forgiveness and eternal life with Him. So God came to earth in the form of a baby, named Jesus. Jesus grew into a man. Although He was man, he was also God, and knew the future just as God does. He offered Himself to die for sin in our place by being falsely accused, then suffering and dying on the cross. He died for every one of our sins (past, present, and future) because He knew all about us and our future at the time He died. An official Roman seal and guard were placed at the tomb. In order to do this, they were required to verify Jesus' death and bodily entombment. Then, in accordance with procedure, a large stone was rolled over the entrance to the tomb, and a seal was placed over the stone. This tamper-proof seal carried a penalty of death if broken. Even so, the official guard stood watch. This gospel is not one fact, but three: Not only that Christ died for our sins, but also that He was entombed, AND that He has been raised as well. The resurrection is crucial; apart from His resurrection, His death would have no saving value. "If Christ has not been raised, your faith is vain--you are still in your sins" is the inspired statement found in 1 Corinthians 15:12-19. While other spiritual leaders have lived, taught, and died, Jesus Christ is the only One who died for our sins, has been raised, and now lives as the Savior of the world.God sent Jesus, so that we could have eternal life with Him, because of His love for us. Again, John 3:16 says, "For God so loved the world that he gave his only Son, so that everyone who believes in him will not perish but have eternal life." Everyone, of course, refers to every man, woman and child in the entire world. In a sense, Christianity is the most inclusive faith imaginable. Salvation is a gift from God that we did not earn. Ephesians 2:8-9 says, "God saved you by his special favor when you believed. And you can't take credit for this; it is a gift from God. Salvation is not a reward for the good things we have done, so none of us can boast about them." Why don't people accept such a wonderful gift? There are four primary reasons. 1.We want to our own "God" and we don't accept that anyone, even God, has a better idea for how to live our lives more joyfully and fully. These people think that becoming a Christian will bring them a list of do's and don't instead of a loving Father who will encourage them a gently guide them a life that is more full and complete. The problem with this is also that this approach leads to a self-centered existence, ultimatey encouraging disastrous relationships. 2. We think we are too bad to be forgiven, as if Jesus said "I am coming to die for the whole world, except for _____ _____ (your name) because he is too bad for me to forgive. These people forget that Paul, the leading New Testament evangelist and writer was conspiring and complicit in the killing of Christians prior to his conversion of that the author of the hymn "Amazing Grace" was a slave ship master prior to his conversion. 3. We think that it takes blind faith to believe. These people don't realize it takes far more faith not to believe; that the evidence is strong for the Christian faith. 4. Perhaps most commonly, we think we have to earn our own salvation. We want God to accept us based on our own merit We have automatically accepted the idea that we have to earn salvation by being good. However, that is NOT Christianity. While going through life trying to do good works under your own power, all the time you're pushing a lifetime's worth of sin uphill. Your load is growing because your wrongdoing is not being forgiven. In fact, it's simply impossible to make it to the top with the amount of weight that needs to be moved. Thankfully, we have the Good News. Look at the end of Hebrews 9:27-28: "And just as it is destined that each person dies only once and after that comes judgment, so also Christ died only once as a sacrifice to take away the sins of many people." Unlike any other faith, Christianity is NOT about what WE can do; it is about what GOD did. Romans 5:6-8 says "When we were utterly hopeless, Christ came at just the right time and died for us sinners. Now, no one is likely to die for a good person, though some might be willing to die for a person who is especially good. But God showed his great love for us by sending Christ to die for us while we were still sinners." 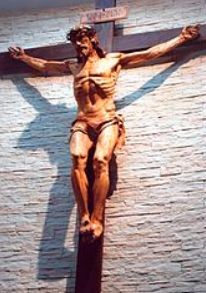 In view of our needy moral condition, we must trust that Jesus took our sins upon Himself and paid our penalty at the cross. When we believe in our heart that Jesus took away our sins by doing this, and accept that He saved us, we are immediately adopted as children by a loving God; from that point on we are in God's arms. The reason that God can accept believers as His own is because Jesus' gift, His Holy Spirit, resides in them. God, as judge, looks at those He has forgiven and sees the righteousness of His Son Jesus. Romans 8:1: "The Spirit itself bears witness with our spirit, that we are the children of God." Galatians 4:6: "And because ye are sons, God hath sent forth the Spirit of his Son into your hearts, crying Abba, Father." 1 John 4:13: "Hereby know that we dwell in Him, and He in us, because He hath given us of His Spirit." 1 Corinthians 2:12: "Now we have received not the spirit of the world, but the Spirit which is of God." So, as Christians, are we challenged to do good works? Surely, but it is not us (in and of ourselves) that do the works, it is the power of Jesus (His Spirit) working through us. Good works cannot earn salvation. Instead they are a result of salvation: Jesus working through us. Look again at Ephesian 2:8-10 For it is by grace you have been saved, through faith—and this is not from yourselves, it is the gift of God— not by works, so that no one can boast. For we are God’s handiwork, created in Christ Jesus to do good works, which God prepared in advance for us to do. Good works are the natural result of the Spirit working in us AFTER was are saved, NOT BEFORE. We are Men and Women "At Work"
If we believe that Jesus is our Savior, we have the Spirit of Jesus dwelling within us. This situation can be illustrated by imagining a bus in which Jesus and ourselves are both on board. That bus has two ways in which it can operate. The first is when we realize that Jesus is our Savior and his Spirit is inside us, but we continue to try to pilot our own lives, rather than letting him do so. When this happens, our lives may seem temporarily better, but things are still distorted; we worry too much, missing out on joy. The second is when we realize Jesus is our Savior, that his Spirit is within, and we decide to let him drive. During the day we tend to shift back and forth between the options above. If we “drive the bus”, we tend to be what others call hypocrites. We are wonderfully saved and adopted by God, but we don't look like Jesus and act like Jesus very much. The more we subject ourselves to the loving will of God, we let the Spirit of His Son, Jesus, pilot our lives.. If you were to die, stand before God, and He were to say to you, "Why should I let you into my Heaven?”, what would you say? If you say Because I have tried to be good or perhaps I am better than most or Because I love others then you have missed the main point of God's Good News. Christians are not defined by good works or family history or church attendance, but instead because they believe Jesus died for them and accept that they are saved only because of what He did (dying sacrifically on the cross), not because of what they did. If you believe what Jesus said, then you know you have everlasting life. After all, He said, "He who believes in me has everlasting life" (John 6:47).